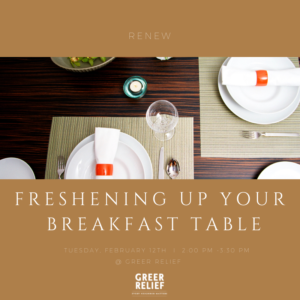 Join Georgia Cloer, for a course on how to freshen up your table with homemade crafts. Class space is limited to 8 people so, sign up for you spot now. This class till be held on February 12th from2:00 PM – 3:00PM at Greer Relief. Only participants 18 and up will receive a RENEW Reward. Register here.